Leticia Balhas been a professional Latin percussionist and backing vocalist since 1990. Since that time, she has developed into a multi-instrumentalist. Besides playing Latin percussion and backing vocals she has become a marimba-, loop station- and bottle organ player and has started composing. Furthermore, she has become a bandleader, producer and musical wizard. In 1999 she founded her own record label Leticia Records. Leticia has invented and still invents many unique musical concepts, all in her very own style. Together with the fine musicians she plays with, she turns these concepts into a succes. In addition to her own produced and founded projects, Leticia plays Latin percussion, marimba and backing vocals in bands with excellent musicians, who can all be found on this website. Leticia's roots are in Latin music which is still her passion. Her music, however, goes far beyond that. During her studies at the Conservatory she was educated in both Latin Percussion and Classical Percussion. Ever since, she has been working and exploring possibilities in both 'branches' and often plays and composes music which goes beyond the borders of those different styles. In 2010 she released her first solo-album, consisting mostly of marimba music of her own hand, often based on the exciting Latin rhythmic structures. The cd was nationally and internationally acclaimed and received many good reviews. 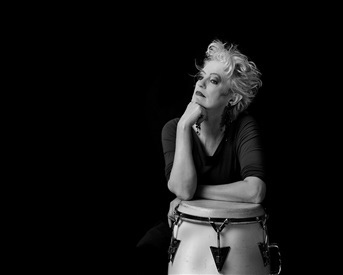 For more than 15 years Leticia taught drums, Latin percussion and Latin ensemble at the Amsterdam Music School (Muziekschool Amsterdam), where she founded and developed the Latin department 'La Escuela'. Many of her ex-students are now successful young musicians or are continuing their studies at the Conservatory. Others just keep playing in bands and have a lot of fun. Leticia lives in Amsterdam, Holland. 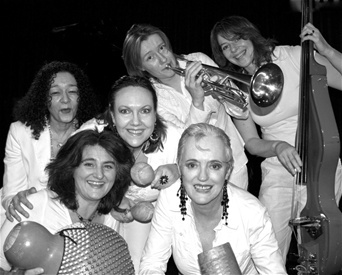 Leticia with her band Rumbadama in jazzclub Paradox, march 2011. Photo by Karla Hoffman.